Getting to Know the Parts of the Ring Project. The Ring Project is a unique high-end sub-ohm tank conceived by Atmizone. It hosts premium sub-ohm factory coils for maximum vapor production and combines minimal aesthetics with high-class customization. 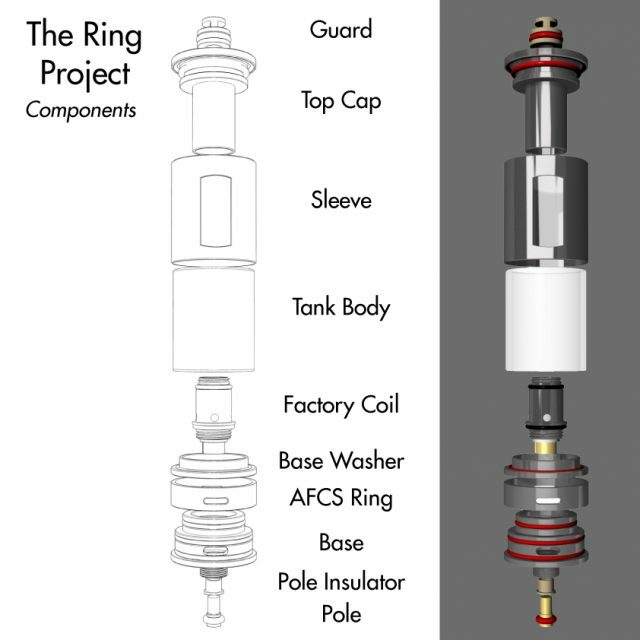 The Ring Project has an easy bottom refill system, highly accurate air flow control from zero to max airflow and extra precious metal plated AFCS ring. Premium 0.3 Ohm and 0.8 Ohm factory coils. Easy bottom refill that minimizes leaking. Highly accurate air flow control from zero to max airflow. Extra precious metal plated AFCS ring of your choice out of the box. High grade material: SS316 metal parts, precious metal custom ring plating. The Ring Project mainly consists of the following parts, as shown in the two detailed graphs below. There is no need for boiling/cleaning preparation of your new The Ring Project before first use. All parts are cleaned in ultrasonic bath and sterilised with hot steam before assembled and put in the box. 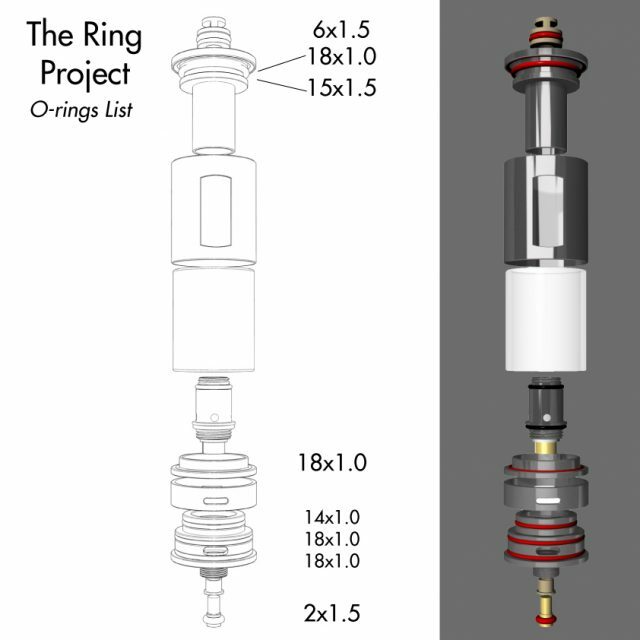 However, before using your The Ring Project for the first time and after any washing/maintenance of its components, always lubricate the o-rings and the surfaces of collaborating parts, by using your e-liquid as a lubricating medium. This will ensure long life and optimal function of the device and its real time adjustments. Especially red and transparent white/clear o-rings should be handled with attention while assembling/disassembling, as they are silicone o-rings (thus softer than NBR black o-rings). Rotate the AFCS Ring to align its slot with bigger or smaller part of the corresponding slot on the Base right below. Adjust air flow according to your need, from zero to maximum air draw. Turn the tank upside down. Grip the upper rim of the Top Cap firmly and unscrew the Base by rotating its rim counterclockwise. The Tank section is revealed. Top up by dropping liquid at the space between the Tank inner walls. Top up to the maximum of the Top Cap tube walls. Screw Base back on and rotate clockwise fully, until tank components leave no gap between them. Unscrew base from tank. Remove old coil from Base by rotating anticlockwise. Prime new coil threads and o-rings with some e-liquid. Install new coil by screwing fully on base clockwise. Screw Base back in position, with new coil on Tans section. Make sure you screw in fully, until tank components leave no gap between them. Regular maintenance and cleaning of the device is required for health and hygiene reasons (e.g. on weekly basis). – All parts can be washed thoroughly with mild detergent (dish washing detergent) and rinse well with tap water. -Before first use and after each wash/maintenance, lubricate all o-rings and threaded parts of the tank with some e-liquid. This will ensure longer life ans easier collaboration of parts. -After installing new coil, make sure you fully screw the coil inside the Base. After refilling and after installing new coil, make sure you screw Base fully on Tank section.